We briefly tackled the diffuser controversy earlier in 2014 with The Diffusor in Tequila Production: Are They Cheating? and in Craft Tequila–WTF Does THAT Mean? Part 2 where we featured our Craft Tequila Gauntlet to help you make better buying decisions when seeking quality craft tequilas. The Pastry War’s stance on diffuser produced tequila and mezcal. 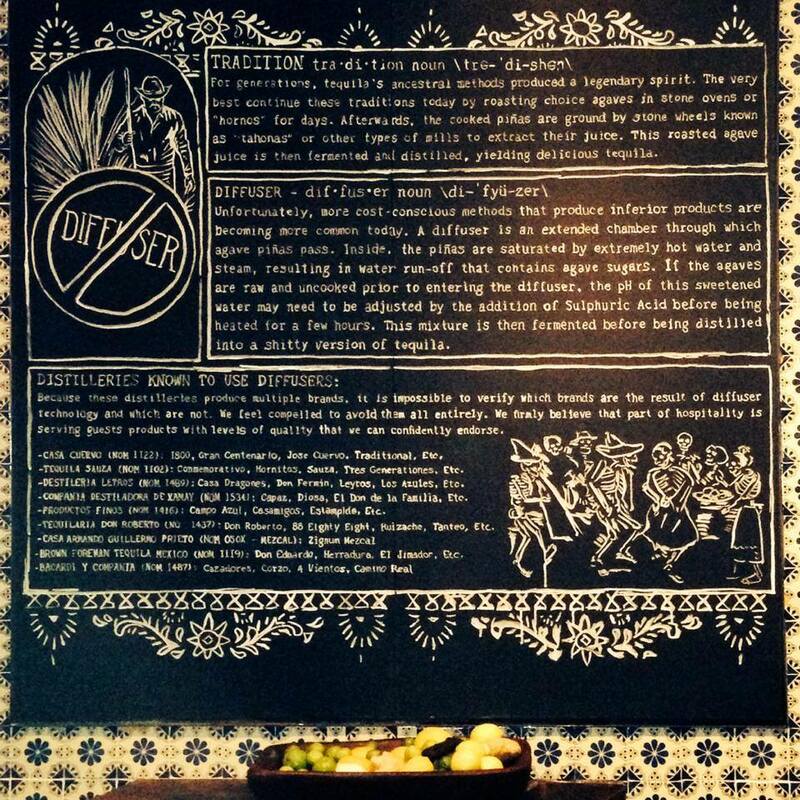 On the wall of The Pastry War, a world renowned mezcalería and restaurant in the heart of Houston, TX, this chalkboard message proudly explains why owners, outspoken agave advocates Bobby Heugel and Alba Huerta, staunchly refuse to serve tequilas and mezcals produced with a diffuser. Let’s look more closely at this cursed contraption. Diffuser, by its own definition, denotes watering, stripping, deflecting or softening down the finished product, whether it be light, air, or agua miel, what will eventually be distilled into tequila. Diffuser denotes watering, stripping, deflecting or softening down. Is it necessary for tequila? Maxwell’s statement above excludes the use of authorized additives to blanco (unaged) tequila, of course. As of December 2012, such practices have been outlawed by the CRT in its normas (rules and regulations governing the production of tequila). It remains to be seen how well it will be enforced, however, so your pricey, Fruit Loop scented blanco may still be safe for a year or two until inventories are depleted. Spanish diffuser manufacturer, Tomsa Destil, offers a closer look at the mega-masher and its process, which seem to go hand-in-hand with column distillation. The site mentions that they have installed 12 diffusers for use in agave processing, but makes no mention of their clients, nor if sulfuric acid to extract sugars from agave is also needed. While controversy swirls around the use of a diffuser, most educated tequila aficionados understand that it is not illegal to do so. In fact, its application was accepted by the CRT some time ago. Diffuser use is not prohibited in tequila production. Read about it here. As we mentioned in item #5 of our Craft Tequila Gauntlet, diffuser use by a distillery is a closely guarded secret even though it is a fairly large piece of machinery to try to hide. There is a stigma attached to it, with most distilleries that have one completely denying that any of their star brands are processed with it. While most of the Tequila Industry’s heavy hitters are known to possess diffusers, many also own regular shredders, autoclaves and even stone ovens. Ask any major brand owner whose tequila is produced at these maquiladoras (large production facilities that churn out juice for contracted brands) whether they are a by-product of a diffuser, and they vehemently deny it. Why is there a stigma attached to using a diffusor in #tequila production? In the Twitter thread attached to The Diffusor in Tequila Production: Are They Cheating? it was revealed that Casa Herradura had used a diffuser from 2001-2010. 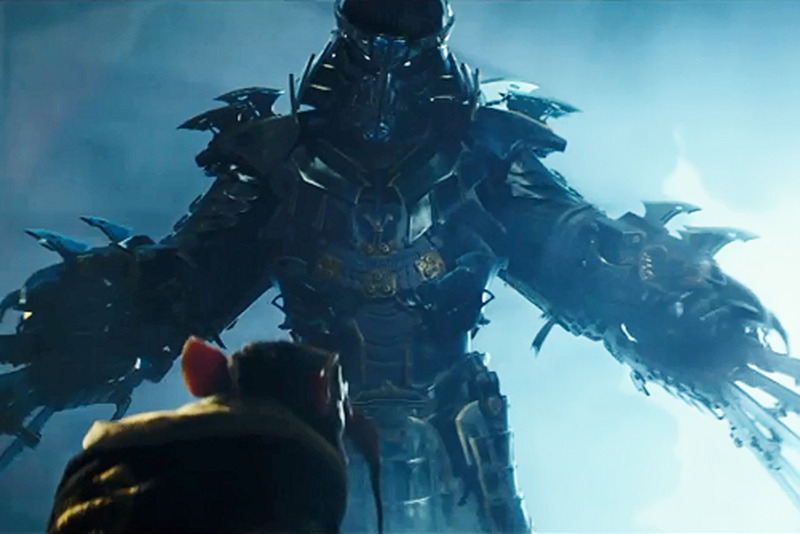 The historic tequila maker initially implemented the super shredder during the last great agave crisis of the late 90s. Years later, it was taken to task by an organized group of key concerned mixologists and tequila supporters who refused to use Herradura in their cocktails or to include it in their bar menus due to a drastic change in its original flavor profile and quality. Herradura finally succumbed and stopped using it for that label. 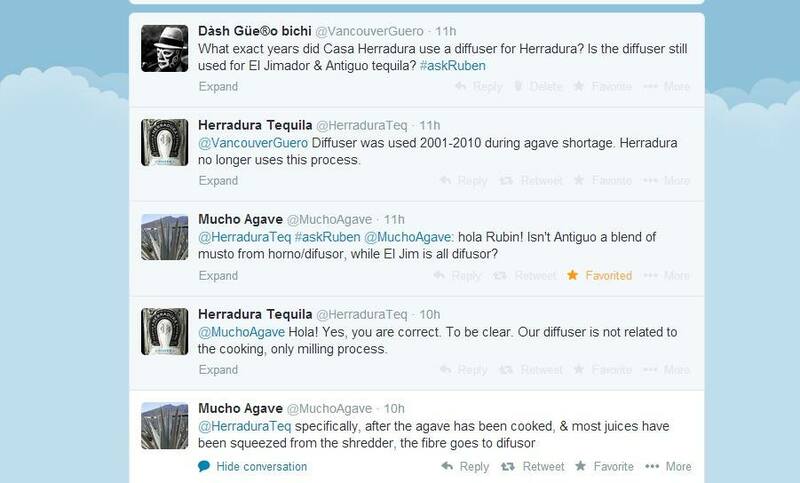 In the following screen captures of a Twitter chat from May 1, 2014, Ruben Aceves, Casa Herradura’s Director of International Brand Development, admits that the diffuser is now only used for their Antiguo, El Jimador, and Pepe Lopez brands. Aceves had previously come clean to spirits writer, Emma Janzen in her article for The Statesman here. 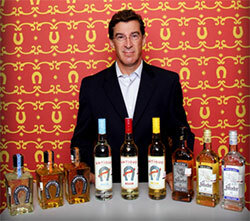 In Khrys Maxwell’s aforementioned blog, he lists tequila producers known to employ diffusers. Tequila Aficionado also includes this list on every updated NOM List for your convenience. Destilería Leyros (NOM 1489) doesn’t hide its #diffuser use, taking pride in its efficiency. Destilería Leyros, producers of their flagship brand, Tequila Don Fermin and many others, bills itself as a model for modern and efficient tequila making. It was proudly represented that way even in the wildly popular Spanish language telenovela Destilando Amor, where it stood in for the then fictional Destilería Montalvo. Enrique Legorreta Carranco, one of the owners of Leyros, agreed to answer some of our questions and to try to help dispel the myths and mysteries surrounding the diffuser. “We respect a lot [the] traditional process. The only thing we believe is that the consumer has the last word to choose between one tequila flavor from another. Diffused or no? Consumers have the last word in choosing between one #tequila flavor & another. 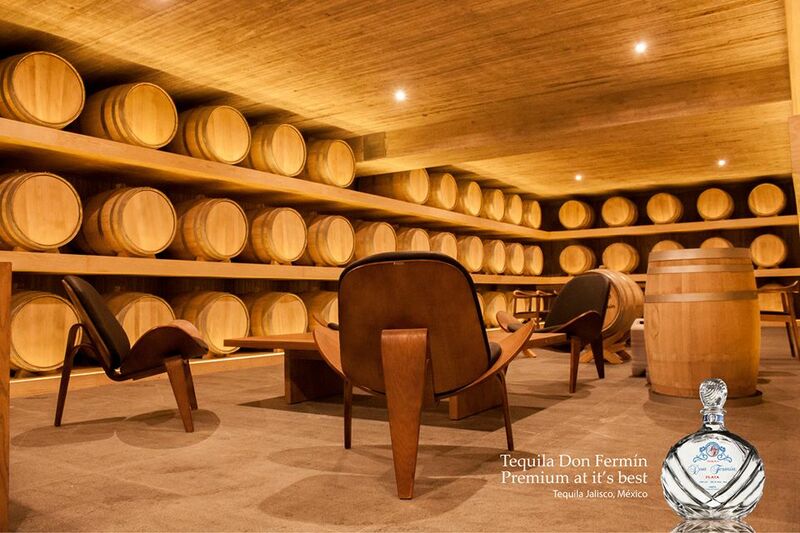 Don Fermin barrel room at Destilería Leyros. (and advertise in their marketing materials!) the use of additives in their aged tequilas (“finished and polished”), Sr. Legorreta asserts that juice made with a diffuser is simply another style of tequila. Consider the economics: As more distilleries use the #difusor, there will be less jobs available. In conclusion, if current figures are correct, exports of tequila rose 16% to US$568 million in the first six months of 2014, compared to the same period last year. It is expected that China will import 10 million liters of tequila in the next 5 years. Where will Mexico find enough agave to serve their thirsty customers? 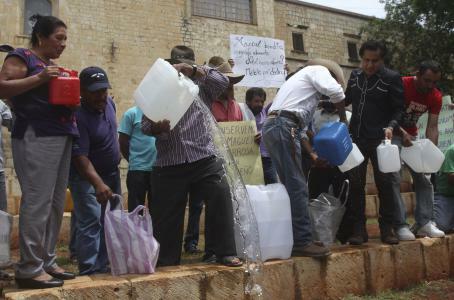 On September 4, 2014, dozens of mezcaleros (mezcal producers) dumped 200 liters of mezcal onto the streets of Oaxaca City in protest for their government’s lack of support against tequileros from Jalisco who are allegedly raiding tons of espadín and other maguey (agave), the prime ingredient in mezcal, to produce tequila. In the process, say Maestros del Mezcal Tradiciónal del Estado de Oaxaca (a trade association) 15 of the 32 varieties of maguey native to Oaxaca are in danger of becoming extinct. Are tequileros from #Jalisco raiding tons of #espadín to produce #tequila? 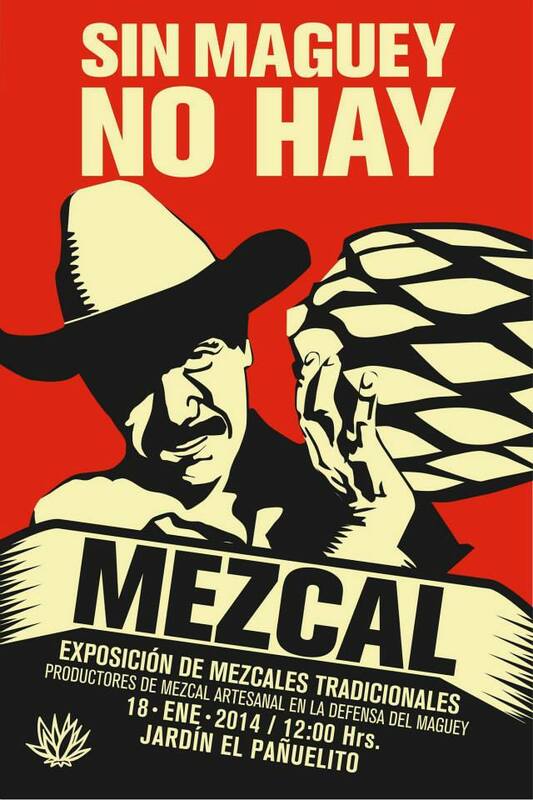 Without maguey there is no mezcal or tequila. Thanks to these transnational maguey marauders, the burgeoning mezcal industry’s days are numbered, it seems. These days, filling orders to emerging world markets is more important than the blatant disregard for the Denomination of Origin. Is filling #tequila orders for #China more important than the blatant disregard for the DO?